(To be) A thing per se (a thing by virtue of itself), or a thing per accidens (a thing by accident, a thing not by virtue of itself). A being is generated by its dynamical system, when (at last) the elements of the system together form an intrinsic whole, a definite pattern in time and space. The pattern is a totality-result of the dynamical process, it is the result of the interaction between the elements of that dynamical system. Figure 1. A Granite from Sinai, Egypt. All of this contrasts with (something) being just an aggregation-result. 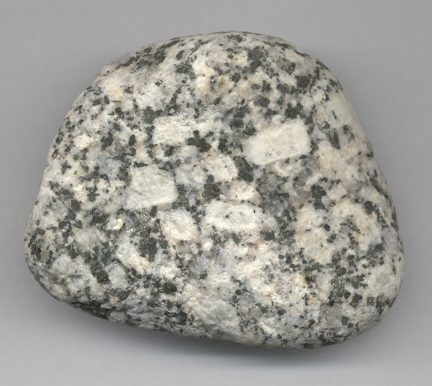 For example a Granite (Figure 1.) is a rock composed of three kinds of minerals and is just an aggregate of (these three kinds of) crystals. The way these crystals are clustered together is caused by random external factors, not intrinsically belonging to the mixture of the crystals. That is the reason why their mixed 'pattern' is not repeatable, unless everything else in their surroundings would repeat, that is to say, that pattern is utterly sensitive with respect to prevailing external conditions, it is in fact totally dependent on these conditions. Also the boundaries of the mixture are caused by extrinsic factors. Such a mixture, say, a Granite, is not the result of the interaction of the elements, in this case the crystal constituents of the Granite. Such an aggregate can be called a whole, a thing (in the form of a rock) per accidens, (i.e. by virtue of something else), while a single crystal is a w h o l e per se (i.e. by virtue of itself). Figure 2. Amphibolites derived from basic igneous rocks. Thin slices of the metamorphic rocks are shown. These are formed by recrystallisation of basic volcanic rocks. We can clearly see that such rocks are aggregates of crystals. Figure 3. Miscellaneous Sandstones. The rock-slices shown are of sedimentary rocks. A sediment is an aggregate of rock grains, grains, which could have come from anywhere. So this is an aggregate in a much stronger sense than the above rock type (Fig.2.) that originated in one locality. An Astroid named Eros encountered by a NASA spacecraft. Eros is consisting of the minerals Pyroxene and Olivine (both common in and on the Earth). 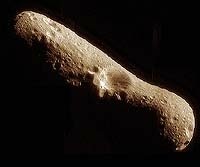 Eros is a space boulder, 21 by 8 by 8 miles in size, that orbits the sun. It currently is about 160 million miles from Earth. It is a typical Aggregate, but it does not seem to be just a rubble pile, like Mathilde, the large astroid NEAR (= Near Earth Astroid Rendezvous mission) passed and photographed in 1997.
Who wants to know more about Eros, click here. Figure 4. Graphic granite, Hybla, Ontario. Quartz dark, Microcline light. Here we also see an aggregate, but the constituents are inclined to form something like a pattern. So such a rock is a little further away from being a pure aggregate and tends to be an intrinsic unity. Figure 5. 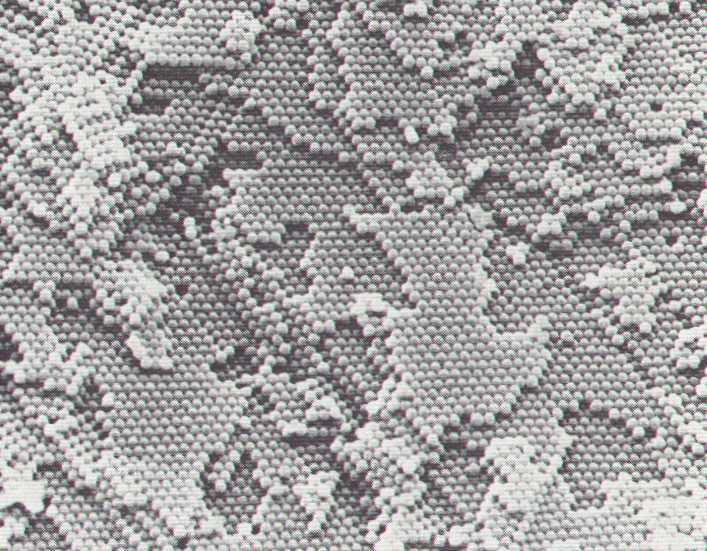 Scanning electron micrograph of an OPAL with chalky appearance showing hexagonal packing of silica spheres (diameter of spheres approximately 3000 Angstrom (1 Angstrom = 0.00000001 cm). Because of the weak bonding between the spheres they are completely intact. 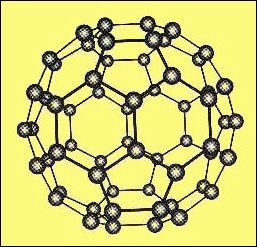 Here we have an example of an aggregate wich is almost a Totality, although the pattern is not very elaborate, it is just a dense packing of weakly bonded spheres, wich are themselves probably more stronger Totalities (consisting of SiO2 + Water). In the same way and for the same reason as it is an intrinsic whole, a single crystal shows i n d i v i d u a l i t y, it is an individual, while an aggregate is a multitude of individuals, and so by itself (it in fact does not have an 'itself') only an individual per accidens (i.e. by virtue of something else). 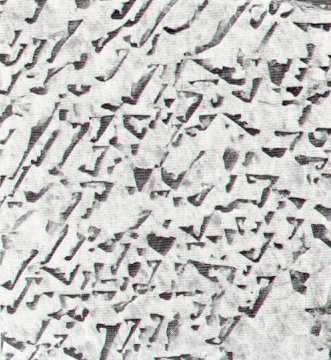 Iceflowers are aggregates, but nevertheless showing definite patterns (although they are hard to be repeated exactly). 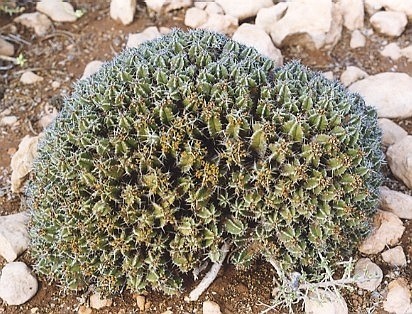 Iceflowers are more or less intermediate between a fully-fledged totality and a pure aggregate. Such a gradation we also encounter among organisms. Some organisms are more or less like a colony of organisms, instead of being a single organism, for example Sponges. Even among single crystals we find mixed structures (mixed crystals) known as solid solutions. Such crystals are situated not at the extreme end of the scale Aggregate ......... Totality, but shifted a little bit away from (being a) totality, and so situated a little to the left. So in this context a 'something' is a u n i f o r m b e i n g, a per se thing, only insofar as it is a totality, and insofar as it is not an aggregate. Insofar as it is an aggregate it is (only) a thing per accidens. In Philosophy a totality, as defined here, is called a Substance.